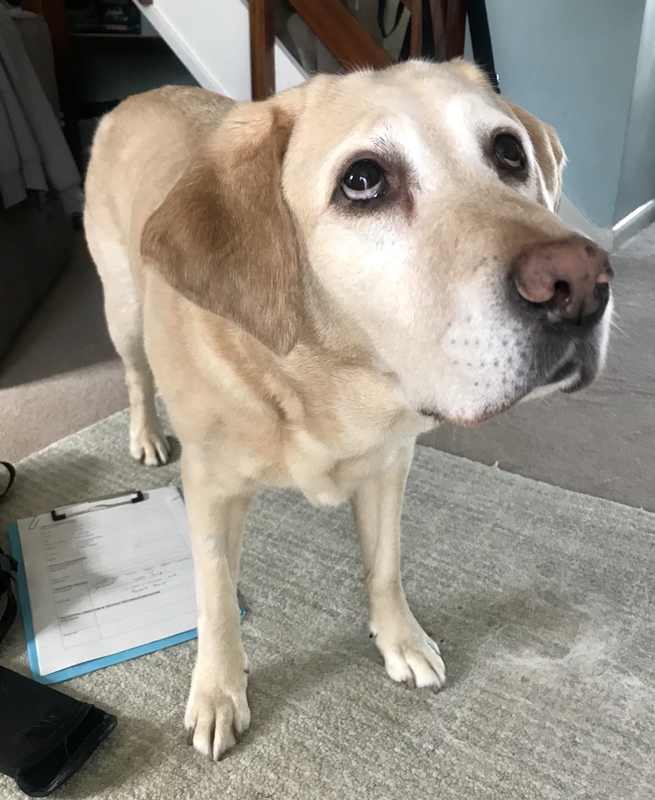 Roxy is a 10 and a half year old Labrador who was rescued a couple of years ago. Her Mum wanted to make sure her life continued to be full of enrichment and comfort. Mum Mel is a graduate of the Healing Animals Organisation and came along to both our Relax HAO modules – Levels 1 and 2. 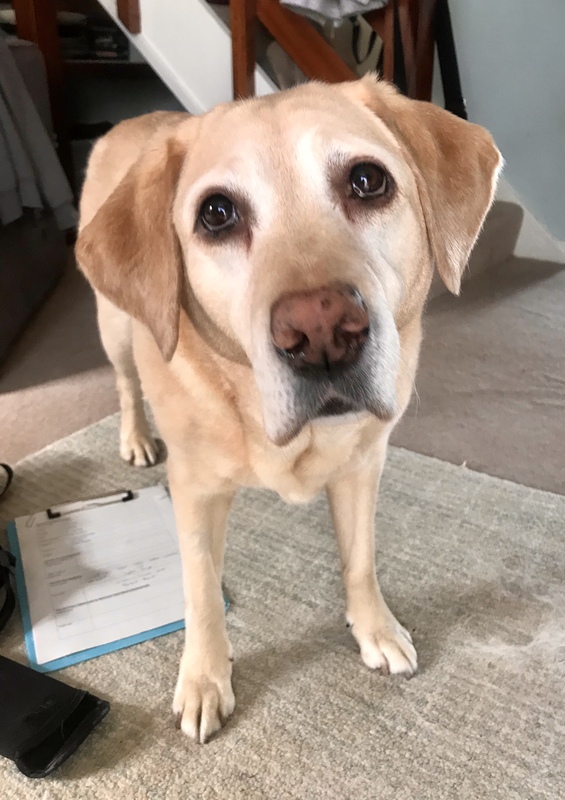 Roxy came to Level 2 and during the course transformed from a reactive vocal girl to “It’s ok..you can walk over and around me now…I’m so chilled, happy and relaxed” girl. She has started to limp occasionally on her left hip and sometimes checks herself before moving in a “I can do this….I just need to think about it first” way. The vet said that she is displaying general wear & tear with possible arthritis and stiffness on the back left leg. Despite being used to massage from Mum, my session was probably longer and more targetted than she has had in a while. She decided she needed breaks in between – which is fine. It allowed time to get her fur out of my beard. She seemed overall tight and stiff. Nothing specific but, as the vet said, general wear and tear. Regular targetted intentional massage and exercise should help her enormously. She also needed a lot of myofascial release over her body to free the restricted muscle movement. This will also help her to stand straighter and comfortable. By the end of the 90 minute session, she could barely keep her eyes open. Sitting was way too much effort and lying down preferable. One outcome that I’ve never had before – choice of oils. Along with other therapies, Mel (http://www.melaniemcalpine.co.uk/) practices zoopharmacognosy – self-medication by selecting and ingesting of offered oils. Roxy has been selecting oils for joint stiffness and pain recently. At the end of the therapy session, Mel offered her the same oils, but Roxy was having none of that. Instead she looked at me with a “Hey Dr Les…I’ll have more of what you’re offering please”. Clearly, she didn’t need the extra help of the oils. That will be a useful indicator for her manual therapy progress. This entry was posted in acheypaw, achy paws, AchyPaw, achypaw myotherapy, Brighton Dog Massage, canine myotherapy, canine myotherapy, dog myotherapy, achypaw myotherapy, myotherapy, achy paws, Dog massage, dog myotherapy, massage benefits, multimodal therapy for dogs, Relax HAOK9 Massage, south coast dog massage, therapeutic massage and tagged acheypaw, achypaw, achypaw myotherapy, achypaws, Canine massage, canine myotherapy, Dog massage, east sussex, Relax HAOK9 Massage, south coast dog massage, south coast myotherapy, therapeutic massage, zoopharmacognosy. Bookmark the permalink.